Precious metals futures ended mostly higher Thursday. Silver advanced for a second day in a row while gold posted its first gain in four sessions. Gold for June delivery rose $7.10, or 0.5%, to settle at $1,312.70 an ounce on the Comex division of the New York Mercantile Exchange. 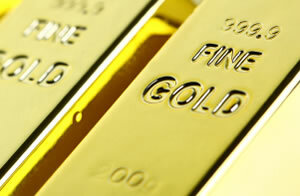 Gold gained "on some bargain hunting in the cash market and on short covering in the futures market," Jim Wyckoff, a senior analyst at Kitco Metals Inc., said in a report. "A slightly weaker U.S. dollar index and modestly lower U.S. stock indexes today are also slightly supporting the precious metals markets." Gold futures ranged from a low of $1,305.20 to a high of $1,319. They slipped less than 0.1% on Wednesday — marking their weakest settlement since March 1, dropped 0.9% on Tuesday and dipped 0.3% on Monday. Silver for July delivery settled up 7.2 cents, or 0.4%, to $16.447 an ounce. Silver futures traded between $16.38 and $16.62. They rose 1.5% on Wednesday, declined 1.7% on Tuesday and fell 0.6% on Monday. July platinum added $10.20, or 1.1%, to $904 an ounce, ranging from $895.10 to $907.60. Palladium for June delivery shed $1.45, or 0.2%, to $958.70 an ounce, trading between $945.85 and $967.60.